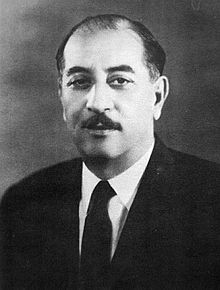 Ahmed Hassan al-Bakr was the President of Iraq from 17 July 1968 to 16 July 1979. He was born in Tikrit, Ottoman Iraq on 1 July 1914. He was a member of the Arab Socialist Ba'ath Party, and later, the Baghdad-based Ba'ath Party. During his rule Iraq had high economic growth due to high international oil prices. Al Bakr slowing lost power to his cousin Saddam Hussein.